Steven Moffat's first proper Doctor Who script involved a little boy who goes around asking "Are you my mummy?" And motherhood has been a major theme in Moffat's Who stories ever since. Tonight's "The Doctor, the Widow and the Wardrobe" wasn't quite in the same league as last year's "Christmas Carol," which was a masterful character study anchored by Michael Gambon. Instead, this year, the central figure is Claire Skinner's Madge Arwell, who doesn't carry the same weight as Kasran Sardick, for a variety of reasons. Actually, the first 15 minutes or so of "Wardrobe" are pretty wonderful. The Doctor falls out of an exploding spaceship, inside a spacesuit that he's put on backwards. After he crashes on Earth, Madge Arwell helps him find his way to his TARDIS (with a false turn along the way) and he promises to help her if she ever needs him. Fast forward a few years, and it's World War II: Madge's husband is flying a bomber and is missing, presumed dead. 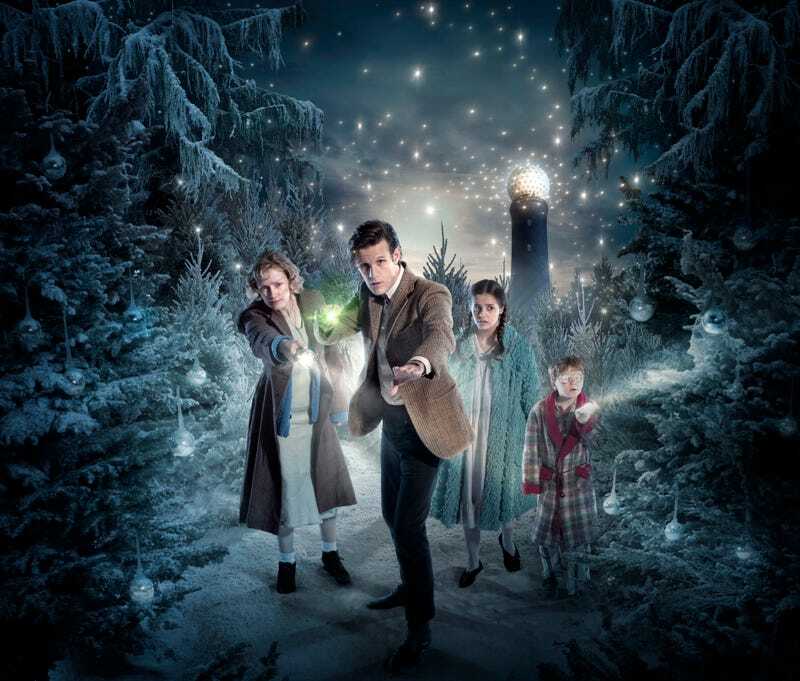 The Doctor decides to give Madge and her two children the best Christmas ever — except that his present turns out to be a horrible death trap. Madge is an immediately likable character, and her plight is super affecting — she's chosen not to tell the children their father is dead until after Christmas. And now she keeps getting angry at her children for no reason, because they're being happy, even though they're soon going to be miserable. The scene where she talks about this with the Doctor is by far the best moment in the episode, and it's genuinely affecting and brilliant. As the Doctor sums it up, what's the point in the children being happy when they're going to be sad later? And the answer is: Because they're going to be sad later. It's a sweet, genuinely emotional moment that you can't help getting a bit choked up over. As long as the episode is concerned with the story of Madge and her kids spending Christmas in a weird old house, where the caretaker is mad, it's cracking good fun. The Doctor's modifications to the house are wonderfully demented, including hot, cold and lemonade taps, dancing chairs, hammocks, and so on. Moffat often seems to be at his best writing about small family units, with intimate quasi-sitcom humor. And there's just something about Matt Smith's Doctor, when he's being a bit of an irresponsible instigator who's on the side of children against the adults, that reminds me of the Cat in the Hat or something. It's a really lovely vision of the Doctor as heroically childish. Once everyone goes through the magical portal to not-Fairyland, though, the episode sort of degrades a bit, and gets a bit mushy. The actual story involves lots of people standing around explaining things to each other, which is always a bad sign, and there's a series of arbitrary events, that seem to happen mostly because we need our heroes to be in danger. The Doctor's portal leads to a Christmassy planet where the trees happen to secrete baubles that look sort of like tree ornaments. But the trees are actually alive and sentient, like the tree spirits from that James Cameron movie about blue cat people. And it turns out a group of humans planted them or engineered them (it's a bit vague) and now the humans are going to drench the forest in acid rain in five minutes' time. But the trees have an escape plan, involving leaving their physical presence behind and becoming pure life energy. To do this, though, they need a female adult human to pour their essence into, and Madge Arwell shows up just in time to fly the tree spirits through the time vortex, and also take her children home. Oh, and save her husband. Also, the trees create a tree man and a tree woman, and build a big tree castle. You know the story's a bit underwhelming when the characters have to keep commenting noisily about how cool it really is. Every few minutes, Matt Smith puts all his formidable gusto into announcing that Madge Arwell is flying a forest through the time vortex with her mind, and that this is really really cool. Really. Even though to all appearances, we've just spent the last half hour listening to characters stand around discussing plot devices inside a harvester set and a tree-castle set. Luckily, because this is a Moffat episode, even the slow middle part is crammed with quotable, memorable dialogue that would be in your .sig file if anybody still had .sig files. I think where the episode really falls flat, for me, is the bit where Madge Arwell meets the trio of humans who are hanging around in the forest that they know is about to be doused with acid. And they hold her at gunpoint, except that she cries so hard they decide to lay their weapons down, so she can get the drop on them. Oh, and one of them has "mommy issues," so he can't stop crying uncontrollably. I can see how it might have seemed like a funny sequence in theory, but in practice it feels like the episode sort of grinds to a halt. I do like the idea that their scanners can't tell the difference between weapons and wool, though. This is also one of those Moffat episodes where the lack of a real strong antagonist is a bit of a problem — the tree people are teased as a potential enemy, but turn out to be happy tree spirits. The humans are sort of bad, but more just useless and tree-destroying. (And even that isn't really evil, since apparently the humans put the trees there in the first place. They just don't realize the trees are sentient.) Because there's no real antagonist, there's nothing much to react against, except for the auto-acid rain thingy. Luckily, the whole thing picks up again towards the end, as Madge's tree-castle flies through the time vortex and she homes in on her husband, the day he was lost over the English Channel. Her glowing time-ship-tree provides a light for him to follow "home," and his plane lands safely just outside the cottage with the dancing chairs and stuff. Just as Madge is finally forced to confess to her kids that daddy is dead, the Doctor reveals that daddy is fine. Everybody lives! And after the Doctor confesses that his friends think he's dead, Madge convinces him to go spend Christmas with them. So the Doctor descends on Amy and Rory, who have been keeping a place set at dinner for him, because he's Elijah. Anyway, the whole episode is sort of a parable about the power of a mother's love and stuff. Madge is set up as being a nurturing figure who's always taking in strays, and her willingness to cart a spaceman angel all over the countryside looking for the right Police Box is an encapsulation of her general motherly goodness. Later, when we see her struggling with grief and trying to keep her children's spirits up while also being cross with them, it's a brilliantly human (or "humany wumany," as the Doctor would say) performance. But it's after we travel to not-Fairyland that the episode really sets up its lesson about mothers and maternal mojo. In the language of the tree people, boys and men are "weak," while girls and women are "strong" — because in their parlance, "strength" is fertility, or the capacity to carry other life within yourself. This isn't just a weird translation — Moffat signals a variety of ways that Madge's strength comes from motherhood. She's able to disarm a whole squad of soldiers using a mother's tears, and then convinces them she's willing to shoot them with her revolver by telling them her children are out there. Then Madge (short for "Madonna"?) is able to pilot a harvester thingy that requires years of training to control, locate her children, and then fly them back to Earth using her love for her children as well as her husband. Someplace, there's a grad student working furiously on a thesis about gender roles in Steven Moffat's stories, and here are tons of fresh grist. Just the whole notion of the crown that rejects manhood, and the idea that only an adult woman can be a vessel for the tree spirits. And such is the power of a grieving, protective mother that (semi) professional soldiers turn into total idiots in her presence. Of course, the task of a Doctor Who Christmas special is generally to be entertaining fluff, without much in the way of darkness or complicated plots to overtax the brandy-soaked gray matter. And "Wardrobe" moves fast enough, and is inventive enough, that you can sort of slide past some of the muddled bits and enjoy Matt Smith doing what he does best. And it's nice that, coming so soon after the tribute to Craig's fatherhood, we get an extended tribute to motherhood.